If you don’t use Microsoft’s built-in browsers, you can temporarily disable them on your machine. Here’s how you can do this. Locate the Microsoft Edge folder. Copy and save the name of the folder anywhere you like, as you might need it later on if you want to re-enable the app. Right-click the Microsoft Edge folder and rename it (you can give it any name you want). Click Continue. After this, Microsoft Edge should be disabled. To re-enable the application, give the Microsoft Edge folder its original name back. Go to Control Panel > Programs. Under Programs and Features, select the Turn Windows features on or off option. Clear the checkbox next to Internet Explorer 11. Click Yes in the pop-up dialog box. Click OK and then restart the system. 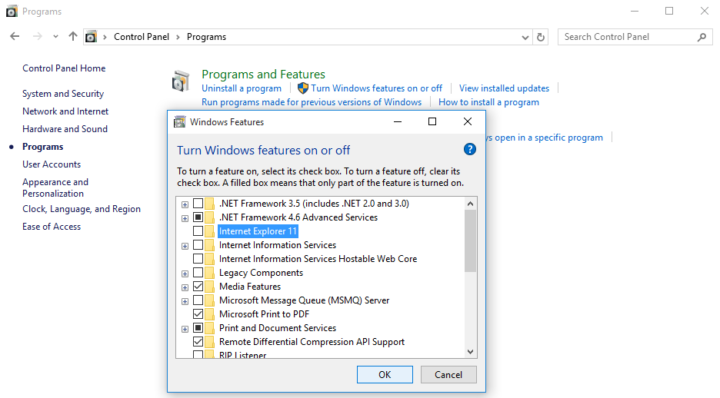 To re-enable the app, go through steps 1 and 2 again, and then check the box next to Internet Explorer 11. Did you find this article helpful? Read this post to learn how to remove and reinstall built-in Windows apps, or check out other Windows tips and tricks on our blog.